For you guys who need to scroll down to the conclusion, I’ll save you the trouble. 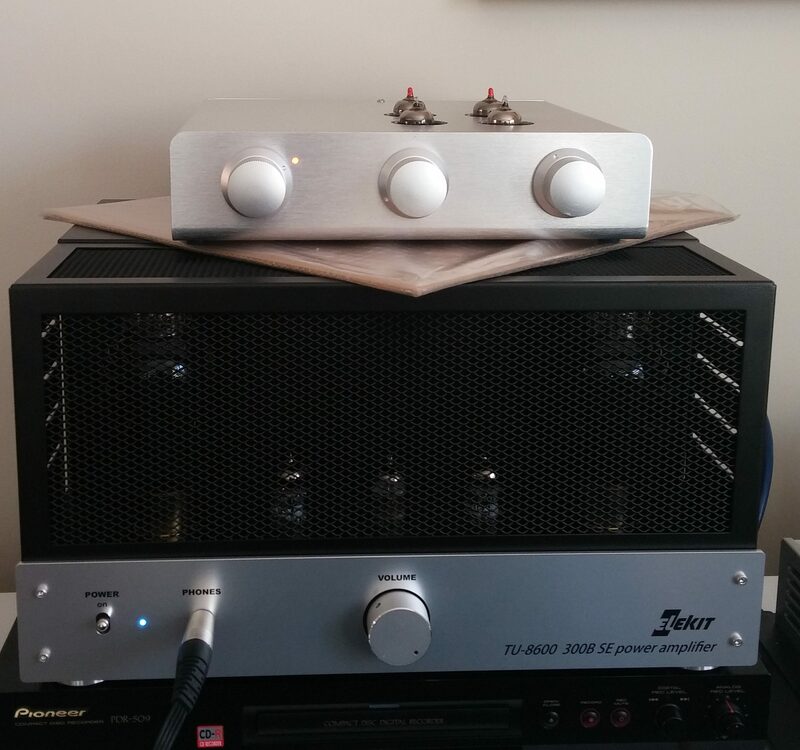 The Elekit TU8600 is a superb amp, and an excellent value. If you can build it, and have reasonably sensitive speakers, I can’t think of a better new amp to buy in 2017. Order it before they’re gone. Seriously. 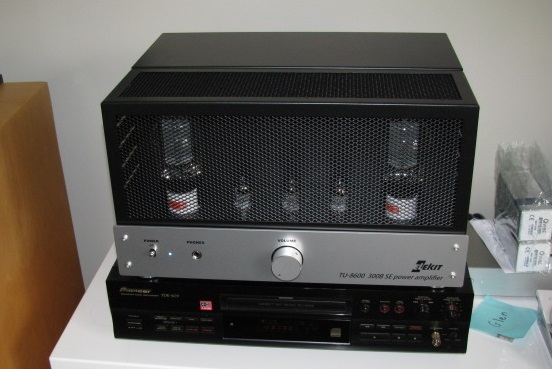 I loved this amp’s predecessor, the 8300R; and the new 8600 is an even better amp. In literally every conceivable way. It’s off the charts, for me. I won’t go into a backgrounder on Elekit, since we’ve talked about them, and already reviewed four of their amplifiers on this site. This is a kit. It comes in a big box with everything you need to build it, minus a few basic tools. Soldering iron is a must, of course. You don’t need a bunch of electronics knowledge, but you’ll need some patience, and a little hand-eye coordination helps. If you struggle with light bulbs or fuses, you might want to ask a friend to build it for you, or to help. Most people can do it themselves. Elekit amps come from Japan oozing with quality and attention to detail. This copy of the TU8600 (a revised prototype model) arrived fully assembled, and included the Mundorf Supreme EVO Silver Gold capacitor upgrade. During the review period, I disassembled the amp (almost completely), and went over the build instructions, which are, as always, outstanding. As mentioned, this is our fifth Elekit review, we’ve done two full builds (TU8340 and TU8500) and this is our third one where the amp arrived already built. I built the TU8500 preamp myself in 2015. In looking over the TU8600’s internal layout and instructions, and having built other kits over the years (from Bottlehead, Tubecad and Hagerman), I think I can safely assess its’ merit as a kit, and the level of difficulty it presents to the ‘average’ hobbyist. Size wise, the TU8600 isn’t diminutive, but it’s certainly not a big amp, either. Being about an inch less wide than typical 17-inch components gives it a slim look – but naturally, using 300B power tubes means it’s also a lot taller than most of that gear. Overall, I’d call it mid-sized – and that definitely adds to the element of surprise at how big this amp sounds. It’s appearance is a bit plain, but the understated look has grown on me. I like the simplicity, and the absence of too many ugly screw heads. It has a classier, more finished look than any other kits I’ve seen. I like that the cage is secure enough without screwing it in, that I can easily remove it or leave it on. 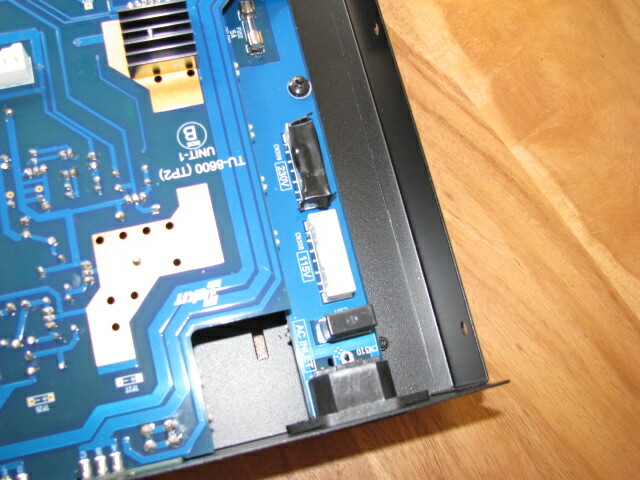 The tubes connect into Unit A, Side B, so this side faces up. Most of the passive parts face down toward the bottom plate. Some of the technical highlights of this design include: Cathode Feedback (CFB) utilizing a third OPT winding (allowing NFB use to be minimized); Active Automatic Bias circuit; a two-stage warmup cycle to save your valuable tubes; and a redesigned voltage gain circuit (2 x 12AU7 + 1 x 12ax7) that allows for 200V peak to peak without wave clipping, i.e. driving the 300B’s pretty close to their full potential. 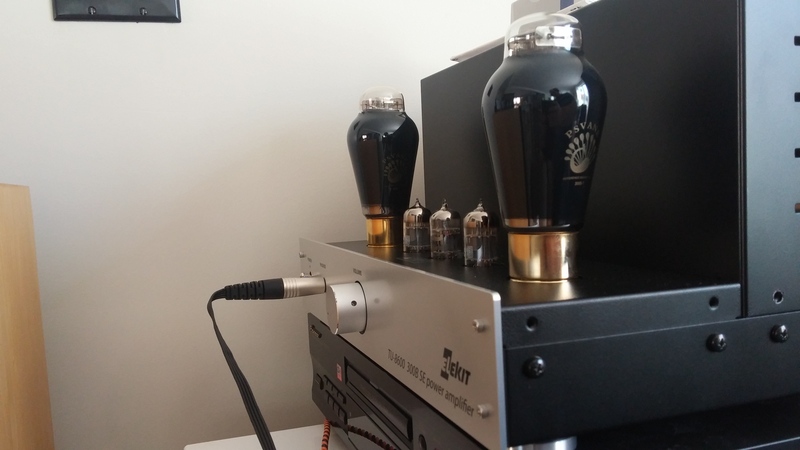 This is a key difference over the TU8300; the designer (Mr.Yoshitsugu Fujita) found that with CNFB being applied, it requires higher input and the amp has to be driven with bigger amplitude than what was achieved with the previous single-stage of the TU8300 (which was 2 x 12at7). Hence the 3-tube input/gain stage. Like the 8300, the new model continues to utilize a Shottky barrier diode for rectification. This method tends to deliver a tighter, faster, punchier performance than tube rectification, with the tradeoff being a less tube-like presentation. It’s a tradeoff that I personally prefer, not everyone does. Also new here – a headphone amp circuit. And it’s a good one, too! For a commercial blurb highlighting these technical features and specs, you can have a look at the Elekit product sheet. Pricing: in North America, where VK Music is the exclusive distributor, the basic amp kit will be priced at $1185 (USD), without tubes. Add around $300 for tubes and we are in the $1500 range. There are tube sets available from VK Music, if you want them to ship with your order, as well as resistor and capacitor upgrades. They are all worth considering. Most important, VK is offering custom Lundahl (LL2770) output transformers, at an upgrade cost of $525 per pair. Part 2 of this review will include my impressions on the Lundahl upgrade. But I’ll say outright now, that if you can afford it, do order the Lundahls while they’re still in supply. They take this amp to another level. The cost isn’t insignificant, but the value for what you get is astonishing. Universal voltage (ex Japan) is available by connector choice. I put a piece of electrical tape over the 230V to remind me which one I didn’t want. For some, the lingering question remains – will I be able to build it? What I’ll say is, although this isn’t a kit intended for novices, it is laid out in a way that really sets you up for success. I’ve included some photos and screen shots – look these over, they should give you confidence. Yes, there are a lot of small details to follow, but if you take it step by step, checking off what you’ve done and making notes of anything you aren’t sure of, you’ll be able to go back and review it (along with your solder joints), and, if you paid attention, the amp will work the first time you plug it in. I think Elekit have made the build process as straightforward as it can possibly be, while still creating a true world-class performing amp. These kits are nothing if not precise; Victor Kung told me that after selling more than 1400 Elekit kits, his parts completeness scoring is still at 100%. Every one of them was correct. After building the TU8500, that doesn’t surprise me. 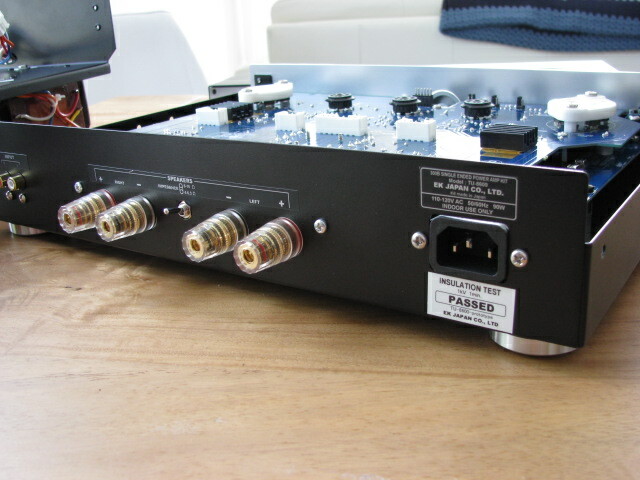 This amp can be used as a power amp, or an integrated amp. Well, sort of. I’ll have more to say on this, further below. Excerpts from the 16-pg assembly manual. Uncouple a few connectors, remove four screws, and the transformer rack comes right off the chassis. Just a caveat to those comments, my speakers are Lowther backhorns rated at ~96-97dB sensitivity, and a very easy impedance load. The Elekit will drive speakers of considerably lower sensitivity, and Part 2 of this review will include a “road tour” to hear the amp with other speakers, in other rooms (friends). My comments so far are based on listening with my Lowthers, and comparing the amp with other amps I’ve been using of late (Pass ACA, Elekit TU879S). *I did also connect some speakers that are in the 88-90dB zone, and the Elekit seems to drive them just fine, but the calibre of said speaker was not good enough to make any judgments with. Listening to the wonderful Bill Evans’ Some Other Time – The Lost Sessions from The Black Forest, I heard a great sense of speed, and impeccable timing. Not the first things you expect to notice from a 300B SE amp, right? I’ve honestly never heard a 300B that sounded this ‘fast’. Piano attack and decay were superb: the tone but also the sense of the piano being a percussion instrument. Cymbal hits were impressive, delicate and amazingly realistic. Upright bass was some of the best I’ve heard on my Lowthers. I could (and did) listen to this 2-CD set for hours on end. On The Grand Budapest Hotel soundtrack by Alexandre Desplat – the male chorus vocals are deep and rich, with loads of air and space around them. Plucked and strummed balalaika sound is stunning. Again, a great sense of flow, with lots of scale, and drama. It was easy to hear each instrument, and how it contributed to the whole. Placement sounded ‘unnatural’, likely revealing that this is a multimiked production with a lot of mixing. Still, nothing detracted from the enjoyment of listening to modern orchestral recordings like this one. Hearing Mussorgsky’s Pictures At An Exhibition (Reiner/Chicago SACD reissue of RCA’s legendary LSC-2201) was an amazing experience! This is a very dynamic recording, when played on a system with good synergy it’s an immersive experience. The amp delivered here. Orchestra scale and placement was also fantastic, as it should be on Living Stereo. Tape hiss was clearly audible, but it just added to the sense you’re listening to the master tape of a landmark recording. This one blew me away. 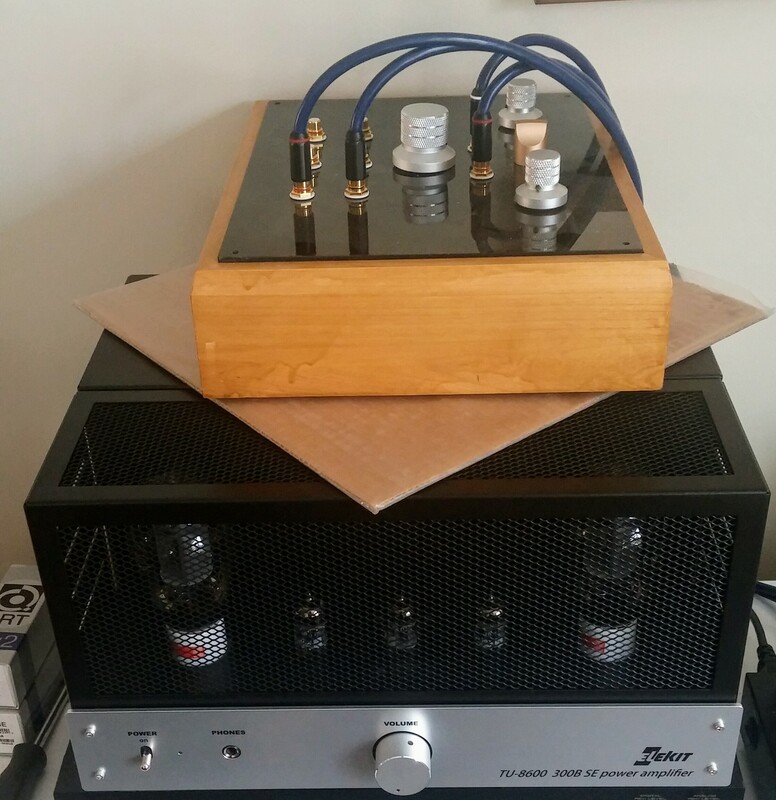 Yes, triode amps can deliver large scale music. This amp did. Moving to Christian McBride’s lovely Night Train – and this track never sounded better. Picking, plucking and bowing of the bass strings, were all out of this world. My notes say “Deeply impactful”. Whatever that means! Again, it’s the speed of the amp/speaker coupling that make this type of recording sound so accurate and detailed. Tracks like this really made me forget about the equipment and focus on the beauty of the music. I made notes on several other well-known recordings (Waltz for Debby, The Tube, Kind of Blue, Midnight Blue, as well as numerous vocal records), the conclusions were all similar…this amp’s sound makes me appreciate the Lowther EX3’s so much more. And beyond that, I’ve been listening to everything and anything I feel like. Whether good or mediocre recordings, the level of ‘revealing’ has been right where I like it to be: not so ruthless to make music unlistenable, but not so forgiving that detail is obscured. A delightful experience. 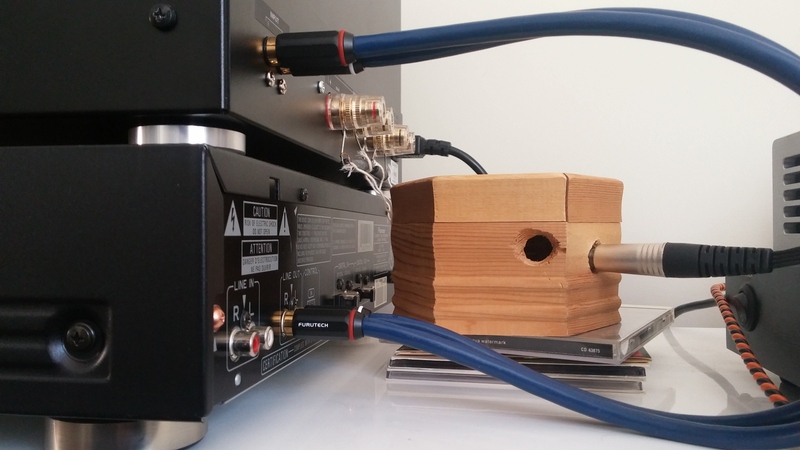 Listening with an active preamp: I did some comparisons back and forth between the Elekit fed directly, and fed through the Aikido line stage (I used another identical interconnect for these tests). When using the Aikido, I pinned the Elekit’s volume pot wide open, to eliminate it from the circuit. My Aikido has a very similar Alps pot, and to be honest, using the line stage had no discernible effect on the sound of the Elekit. I went back and forth several times and really, they sounded essentially the same. Listening with a passive attenuator: This is where it got interesting. 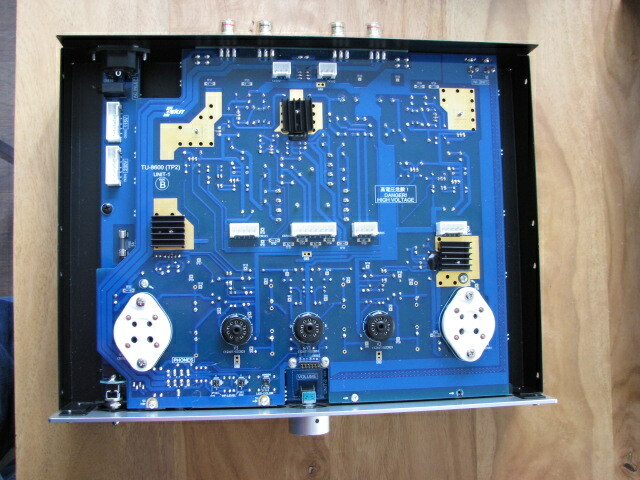 My passive is a switch/attenuator built from the John Broskie/Tubecad/Glass Audio kit. It allows switching between three inputs, and some attenuation – the steps are incremented such that the degree of attenuation control isn’t as good, but that’s because only one attenuation resistor is engaged at any setting (a good thing). And indeed, I heard an improvement using this passive: the sound was more transparent, a little ‘cleaner’ overall. Bass was a little tighter, too. It wasn’t a stunning difference, but it was noticeable. I liked it (consistently) better with the passive attenuator. This leads me to conclude, not that I have a great passive preamp, but that the stock Alps pot that comes with the TU8600 can be improved on; it’s an easy change to make, and the results are going to be evident to the listener. VK Music may already offer an attenuator upgrade; they’ve done this with other amps in the past. It’s worth asking. 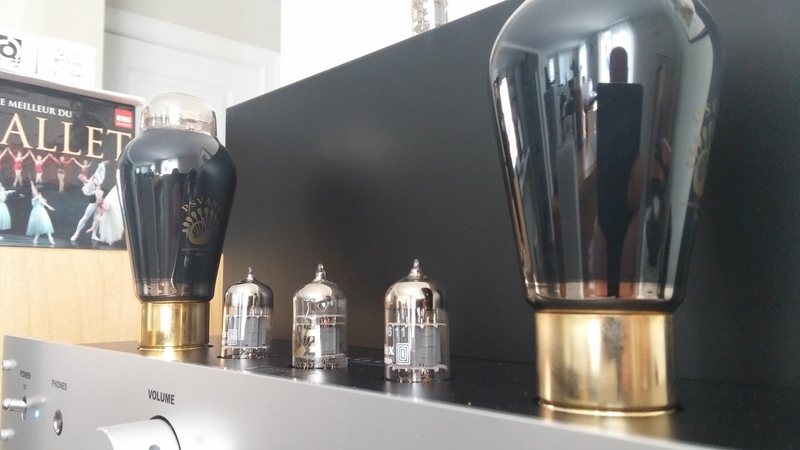 Briefly, I had a chance to compare the Genelex Gold Lion reissues that VK supplied (these are some of Russia’s best tubes) with the premium Psvane’s, which are some of China’s best. Only the 300B and 12AX7 were swapped. This was a casual, non-exhaustive comparison, but I did several back and forths, using Enya’s CD Watermark, and Kenny Burell’s LP Midnight Blue. My first impression was that the Psvane’s play quite a bit louder. Adjusting the gain, my impression was that the Psvane tubes are slightly more romantic sounding – they sound a little warmer and smoother. By comparison, the Genelex Gold Lions sounded faster, and a little more articulate. The Psvane tubes sounded more “tubey”, in the classic sense. Their bass was a touch fatter. Some days you want fast, some days fat is nice. Overall, I still prefer the Genelex by a small margin, especially where value is concerned. To be clear – the Psvane are also great tubes, I enjoy them and they do compliment the Elekit very nicely. I just don’t necessarily see them (for me) being worth the cost premium over the Gold Lions, which were my favourites from the 2015 shootout. Your mileage may vary, and if you find the Elekit to sound a touch too lean (perhaps due to it being ss-rectified), I can see how one could utilize tubes like the Psvane to flavour the sound a little differently. Either way sounds great, but one may please you more, or suit your music better. Tube rolling is fun, so by all means, have some fun. Now, I’m not a headphone reviewer or expert, so please take my comments with an extra grain of salt. Victor kindly loaned me his Audeze LCD3’s – these are better than any previous cans I’ve used (my references up to now were the Senn HD598 and the ATH-W1000). The headphone amp seems to be more than up the task. Critically, the circuit uses the output transformer, not an opamp. 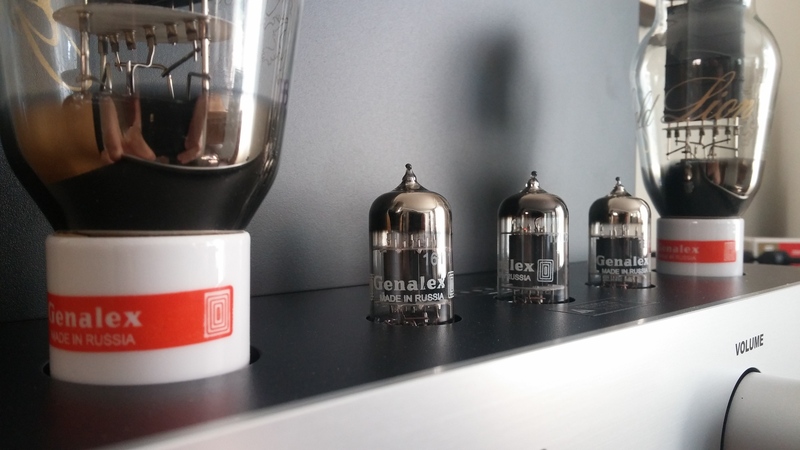 So essentially, you’re listening to the 300B tubes. In my past headphone experimenting, I found this to be a day-night difference. I even built a little box years back, so I could listen to my Audio-Technica’s with my single-ended tube amp. I kept the box around, though I rarely listen with headphones nowadays. So now, being the curious type, I decided to pit the Elekit headphone circuit against itself – by comparing the Elekit’s front jack with my homebuilt box, which uses 10 Ohm Mills resistors on the speaker taps. See the photos if I’m not making sense. Well, my resistor box uses less overall resistance, I think, so it was a little louder at the same gain setting. But after level matching, the sonic differences were negligible. If anything, I’d say the Ellie’s built in circuit sounded a little more refined. Again, I’ll repeat the caveat of my expertise in this area being limited, but I think it’s fair to say that the TU8600 includes a superb headphone amplifier. It may not keep up with a Woo Audio, or some of the other top-end dedicated headphone amps, but it is very good. There are also four headphone impedance adjustment settings – but these need to be done under the hood of the amp. While I don’t have any major criticisms of this amp, there is always room for improvement. What could be improved? Well, frankly, another input would have been nice. We already discussed this, and it’s not a huge issue. Another “nice to have” would be a detachable bottom cover. DIY’ers are likely, at some point, to want to play with different coupling capacitors. 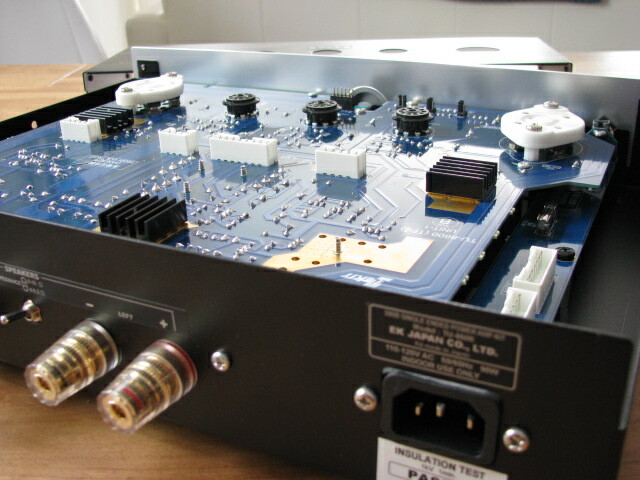 They will find, as I discovered, that once the amp is assembled, it needs to be almost completely disassembled in order to access the top side of “Unit A” – the large pcb where the caps are mounted. I think the choice to face this board upside down had to do with isolation of the passive parts from the transformers – a good choice. But a bottom plate that unscrews easily would have been nice, so that those parts could be accessed from under the amp without a lot of disassembly. Lastly, my tests suggest that this amp can benefit from an upgraded volume pot, or stepped attenuator. I wouldn’t call that an issue, but it’s an opportunity worth noting. There isn’t any question that I’ll be buying this amplifier. I missed out on the 8300R, and I won’t let that happen again. My understanding is that orders are already outpacing supply, and this is listed as a limited production model. So its success is virtually a given. Elekit continues to raise the bar in the fairly-priced high-end game. At an entry price of around $1500, this is a tremendous offering. A commercial Japanese-made amp of this calibre would (and does) sell for several times that much. This is a Wall of Sound Gold Star amp, if there ever was one. There was a lot of clamour for this review, I hope it lived up to the readers’ expectations. There is more that I’d like to cover, a lot more. But like Steve’s TU8340VK series from earlier in the year, these reviews can become long reads, and it’s best to split them up. In the next segment, I’ll be describing the upgrade to the Lundahl output transformers, and adding additional impressions (mine and friends’) of the Lundahl-ized TU8600, as heard with other systems. Been eagerly waiting for someone to review this amp. Any more circuit tidbits in part 2 planned? Tim: the circuit/schematic is proprietary, as you might imagine, and is not being shared publicly. I woke up in the morning to find this techie finally posted! Thank you for your time and I’m looking forward to your review of the Lundahl transformers as well. Please also try to compare it with the TU-8200, for us who are planning to switch. I’d like to know what I’ll be gaining sound-wise, and what I’ll be losing by making a switch, since you mentioned that the amp doesn’t sound like a regular tube amp. It still sounds like a tube amp – but not a budget tube amp. The distortion level seems very low, to me. They also have a Facebook page, if you use FB that would allow you to communicate with an automatic translation. Many thanks for the detailed review of this amp. One of our reviewers owns both an AN Kit One and an Elekit 8230. He may be in a better position to comment. The short answer is “it depends”. With the Lundahl trafos, the Elekit should give the AN a run for its money. In terms of cost, the AN is priced quite a bit higher nowadays. Check what opt you’re getting, before you order one. Looking forward to Part Two!! And with the Lundhal OPT, I wonder how it compares to a SE OTL. My TS SE OTL got water logged in an accident and is unrepairable. Looking at elekit now. I’m sorry to hear that! Unfortunately I’m not familiar with your amp so I couldn’t venture to say how it would compare.